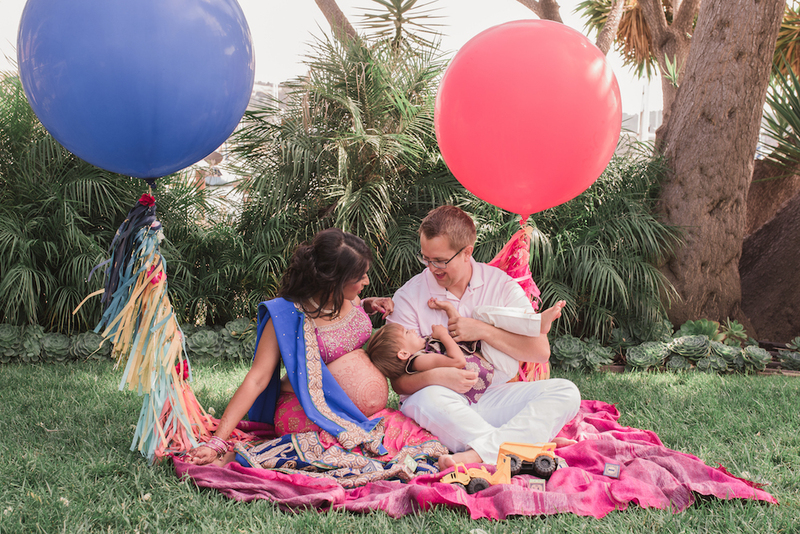 After surviving, planning, and executing two maternity photo shoots and one first year smash cake shoot, I wanted to pen my tips and suggestions for you to have them too. I will give you a word of warning – hire professionals. Yes, they cost money. I am fortunate to work in the wedding industry, and it’s easier for me to find fantastic, qualified people. For you, not so much, but do due diligence and hire pros. At the very least, you need a professional photographer and makeup up artist. Keep it simple – Trickier than it seems. 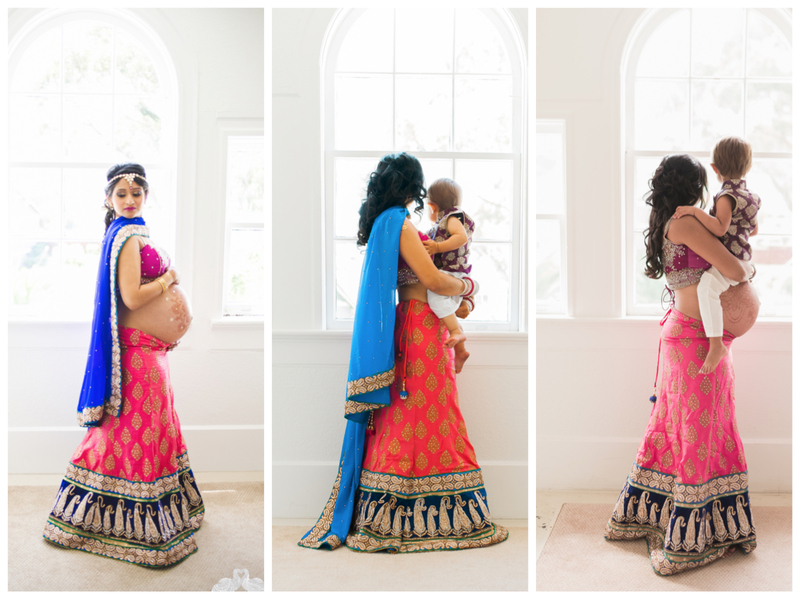 The first year we did the maternity shoot for baby #1, we had a beautiful and elaborate setup with a floral wall, dessert table, picnic rug, and wearable floral garland. I also wore two outfits – a lehenga and a saree. For someone 36 weeks pregnant, we worked 10 hours that day. Not something I recommend, but the payoff was stellar. For the next two years hours, we paired down the decor to really focus on the family and the ability to recreate poses. 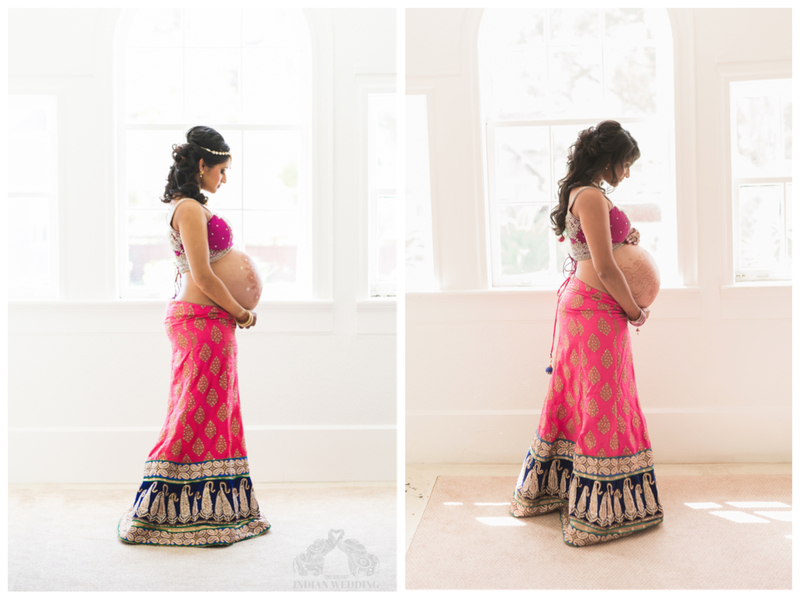 Have a playbook of simple poses – Feel free to pin any of my images or share them with your photographer. (hint hint) Simple, family images will last you a lifetime. Review the poses with your photographer beforehand, this way at the venue your photographer can figure out what is feasible. 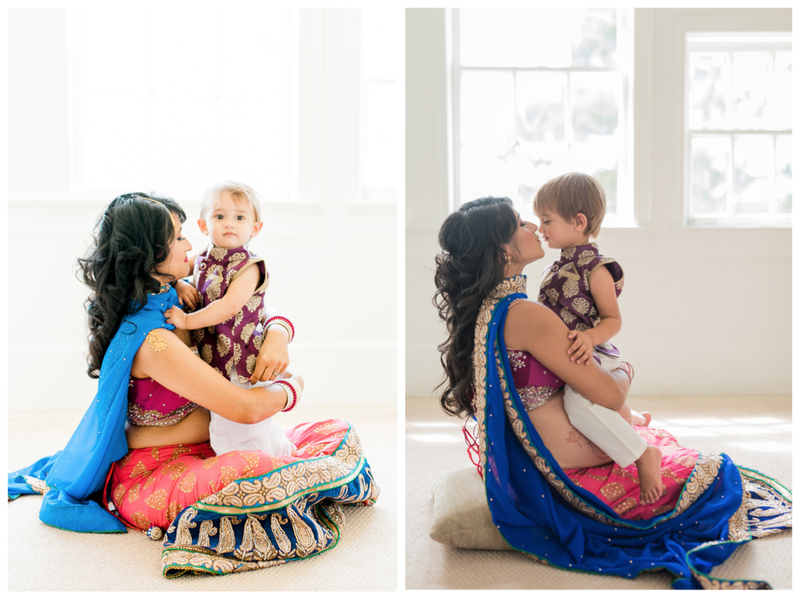 Take a few glamorous poses – When you become a mom, you are not afforded as many options to be the stunning, intelligent glam girl everyone you knows by. This is your moment to take a few snaps. PRINT YOUR PHOTOS – I cannot explain how imperative it is to be able to print your photos for not just the wall, but for mini photo albums. Your children will LOVE a photo book of their time in the tummy and after. You don’t want them clamoring on your computer or phone, so PRINT YOUR PHOTOS. Do a milk bath maternity shoot – This isn’t the same as the family portraits, in fact, it has nothing to do with your family portraits and everything to do with you, lovely mom. Do something for yourself. Hire a professional photographer – I will say this again, HIRE A PROFESSIONAL PHOTOGRAPHER. In fact, if you hire anyone, have them be a professional. Yes, you can do your own hair and makeup, and you can even do it on a budget by heading to a Sephora (which I’ve done and was pleased with), but you can only be pregnant with each child for a certain period of time. And those children will only have a first birthday once. Please, hire a pro to make your photo shoot extra special and professional in quality. Plan the next year – Make sure you pen mark the next year you will do the photo shoot. If possible, book your photographer and baker (for the first year smash cake). This way, you don’t have to stress about knowing if your photographer will be available when you need them. Work with local businesses you love and trust (word of mouth and the internet works wonders). Choose decor that matters to you – This may sound strange to you, but go with decoration that means something to you. We had toy blocks, books, and trucks we love. The pink blanket featured in each of years was something I bought with my friend in Morocco a decade ago. The balloons spoke to our love of fun, while the tassels were something we could keep forever. You can always go to the big box store to buy decoration – it eventually ends up in the trash. Instead look at instagram for individual artists that can create signs or paintings to feature in the photo shoot AND in your home. 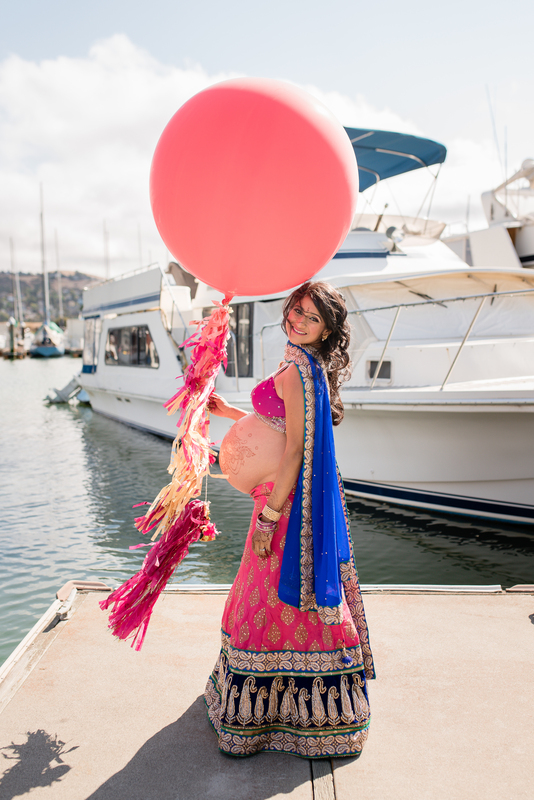 A few of my favorites are The Script Within, Twisted Pen, and Lifted Balloons, a Bay Area couture balloon artist. Be proud to be Desi – Wear your clothes with pride. Put your little ones in them. Get decked out. Your bun(s) in the oven are baking only for so long. Celebrate your time with them.